Hotel Arena in Samokov town near Borovets in Bulgaria. 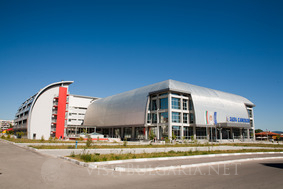 Location: Hotel Arena is located next to the sport's arena in Samokov. Borovets Resort is 10 km away. Accommodation: Hotel Arena Samokov offers 60 standard rooms with terrace and magnificent view towards the Rila mountain and the Iskar River. The rooms are modernly furnished and offer LCD TV, cable TV, internet, mini bar, Air conditioning and a telephone. The hotel also offers three one bedroom apartments with a spacious living-room. Safety deposit boxes can be used at the 24-hour front desk, upon additional charge. Wine & dine: Arena hotel features a modern restaurant, lobby bar and panoramic top-floor bar. Spa centre: Hotel Arena offers an Olympic size swimming pool, a fitness centre, aroma sauna, steam bath, relax zone, jacuzzi and an adventure shower. Conference centre: Hotel Arena in Samokov offers 2 conference halls with daylight, central air conditioning system, and capacity for up to 120 guests.